Oops! Been a while since I posted about Make-The-Cut! Now that the Denver Retreat is complete and I’ve had a chance to catch up on the umpteen To Do items that were postponed because of the retreat, I can now get back to this site and the 25 reasons to check out MTC! Now that Andy has released a new beta 4.0 of MTC, the list is growing, so expect it to be at least 30 reasons by the time I have the MTC User Manual completed and our new Zing is released! Regarding the tweaking of the designs, MTC has short cut keys set up for top (T), bottom (B), right (R) and left (L) alignment, as well as equal vertical ([) and equal horizontal (]) spacing. I also really like the new Esc hotkey to unselect all images. Path thinning is the same thing as Center Line Tracing in KNK Studio and other vector programs. It converts a thick line shape into a single line, such as shown above in the image of the glasses. This can greatly simplify some rhinestone designs, especially lettering, as shown in the video below. It can also be handy when pens or markers are going to be used for drawing images and/or lettering. How many times do we forget the name of the font we used in a design? Well, MTC has a solution for that! When you type new text, the name of the font will be assigned as the name of the layer! This was a brilliant feature to include in a program that is used by those who love to collect the thousands of free fonts available on the Internet! And the first detailed on-line User Manual will be available within about 3 – 4 weeks! I’ve had a number of items on my To Do list for a few weeks and today was a great catch up day for making some miscellaneous videos. Item Number 4: This is something I’ve been aware of since writing the first KNK User Manual, but somehow then forgot about it. In many of my videos you’ll see me select all images of a particular color by double-clicking the color on the Job Palette. It works fine… most of the time! But sometimes, for whatever reason, I will double click and it will just not select anything. There’s another short cut key which does the same thing: hold down the Shift key and click on a color on the Job Palette… same result. All images of that color will be selected. This is the new way of selecting by color I plan to always use. Item Number 5: Another recent discovery that I think I already knew but had forgotten. Most of you know the usefulness and, in my opinion, the necessity of using a mouse with a middle scroll wheel for zooming in and out in the software. However, you may not have realized that pushing that middle scroll wheel will put you into the Panning mode so that you can pan around on your screen as necessary. Pushing it again will turn panning off. VERY handy! I also created a list of suggestions. Note that in same cases I’ve listed several options, so that you can decide which assignment would make the most sense. For example, where I used “F” for Fit Object to Path, you might prefer to use “F” for Flip or Install Fonts. The idea is for you to pick what is most useful for your work AND will be easy for you to remember. The main purpose of this video is not so much about the Easter egg, but rather to illustrate a great assortment of tools and hot keys available in KNK Studio… functions you will be able to use elsewhere in your design work with this wonderful software. Some of these have been covered in other videos and the usage of them in this video will be a reminder. But there are also a couple of new things I show. 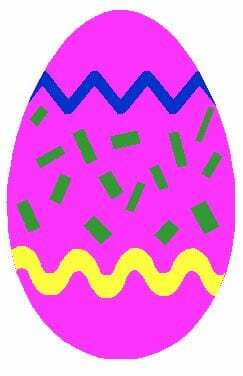 Tranformations: used to distort images -I use it to convert an oval to an egg shape. As a reminder when using the functions in this window, you get different results if you also hold the Ctrl key versus the Shift key versus no key. Try it out! Similarly, in Polyarc editing mode, there is a Divide icon in the Smart Bar which allows you to insert a specific number of nodes along the path between any two existing nodes. Use the Stroke and Fill tools to thicken any open path and then use the Basic Weld tool to convert to a closed path. Select an image and place the cursor over the center. Hold down both Alt and Ctrl keys on your keyboard and drag the center. A copy of the image will be created and you can only drag the image horizontally or vertically to keep it aligned with the original. When Object A is on top of and extends beyond Object B, use the AND Weld tool to trim the excess from Object A to fit Object B. When moving an object on the screen, hold down the Shift key while using the arrow keys on the keyboard and the object will move much faster than if you only use the arrow keys alone. If you have ANY questions about the use of these functions, be sure to post. And here’s the link to the Easter Egg Video! Carolyn in Australia posted the other day and also emailed me privately to find out if I was aware of what happens when you RIGHT click on one of the 9 boxes of a selected image in KNK Studio or Design Master. She had discovered that a pop-up menu appears with lots of useful options. She didn’t remember reading about this in the User Manual and wondered if everyone else was aware of it. The answer is yes… I was aware of it and no… it’s not in the User Manual! I remember being very disappointed that the options to Copy and Paste images were not part of that pop-up menu, as you often find in other programs and when I first discovered this in the early weeks of using KNK Studio, I basically just dismissed this Right click function for that reason. I think I should have made a bigger deal of this menu. 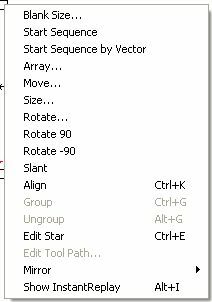 Note that some of the useful functions that are otherwise buried in the menus, can be readily available to use with this Right click option. Specifically, it’s nice seeing the options for Array, Edit (takes you into node editing mode), Start Sequence by Vector (controlling the order in which objects will cut), Blank Size, Mirror, and Rotate. So, try using this over the course of the next few weeks and you may find it to be a rather handy addition to your regular use of the software! Options>Klic-N-Kut Setup>General Preferences: The Duplicates setting controls how far a copy of an image is placed, from the original, when you use Ctrl-D or Edit>Duplicate. Some people want duplicates placed EXACTLY on top of the original. To do that, set the X Offset and Y Offset both to 0. Options>Klic-N-Kut Setup>Display Units: If you want more decimal places shown or fewer throughout KNK Studio, this is the location to set that number. Options>Klic-N-Kut Setup>Selection Tool Settings: If you would like your selected objects to change color, as well as have the 9 little squares showing, then in this window you can check the box next to Highlight Selected Objects and pick a color (from a choice of 6) and a line thickness (1 or 2). This could be handy if you find yourself having a tough time seeing if you have interior parts of images selected or not. Options>Workspace Colors: Bored with the same colors for your grid, guidelines, Sign Blank edge, or background? Personally, I can’t imagine having a background other than white, but for the rest? It’s kind of fun to make a few changes using any of the 9 available colors. View>Toolbars>Customize: Check the box next to Use Large Icons and for those who struggle a bit with the small size of the icons on the toolbar will now have larger, easy-to-see icons. You’ll notice in my videos that I have this setting all the time so that it’s easier to see which functions I’m selecting. View>Show Bitmap Outlines: If you have a tough time, after vectorizing, figuring out which image is your original graphic and which one is the new vector image, then turn this feature on. All of your bitmaps (raster images) will appear as crossed-out squares, thus making it very obvious they are not vector images. Note also that the shortcut key, Alt-M, will toggle this option on and off. I have had many instructors over the years but none that have left me feeling so empowered when I take a class with Sandy. She is a compassionate, patient, incredibly knowledgeable teacher and she never left me feeling like a dunce, which often times I felt like BEFORE taking her classes. If you need to learn by being shown, Sandy is the one you need teaching you. Thanks Sandy for showing us how to get the most out of our little (or big) cutters!